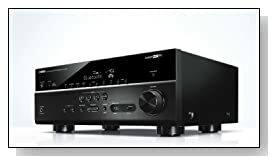 The much awaited Yamaha RX-V679BL 7.2-Channel AV Receiver is finally out in the market and receiving positive reviews from its initial users. The electronics giant is offering state-of-art technology on this premium product. Even the price is set little high, due to its matchless specification, RX-V679BL is expected to grab much attention. We got a chance to spend some time with this powerful product, here’s our Yamaha RX-V679BL review to help you decide whether this 7.2 Channel AV receiver can be part of your home theater setup. 7.2-channel network, 150 W Output Power (1 kHz, 10% THD, 1-ch driven, 8 ohm), 90 W Output Power (20 Hz – 20 kHz, 0.09%, 2-ch, 8 ohm), 4K Ultra HD with HDCP 2.2, YPAO – Reflected Sound Control, Dual antenna Bluetooth and Wi-Fi connectivity, Internet radio, Dolby True HD and DTS-HD Master Audio. The new Yamaha RX-V679BL is packed with high-end technology and features to offer incredible home cinema experience. With its Dolby True HD and DTS-HD Master Audio compatibility, the AV receiver brings up incredible surround sound effects. The premium model is also powered with YPAO – Reflected Sound Control, which analyses the room acoustics and automatically calibrates parameters to enhance the audio experience. With RX-V679BL, the user will have freedom to split 5+2 Channels for main room and secondary room to enjoy Zone 2 Party Mode. This high-end AV Receiver also supports 4K video transmission through HDCP 2.2. Lower resolution SD and HD videos are also automatically up scaled to 4K Ultra HD videos. The unit also supports thousands of internet radio stations around the world, you can tune to your favorite channels including Pandora, SiriusXM, Spotify and Rhapsody. For unlimited music playback, you could also stream music files from Bluetooth enables smartphones. The performance of the review unit was up to the mark and easily met, if not exceeded our expectations from Yamaha products. Coming to the design, the Yamaha RX-V679BL is not remarkably attractive but looks as good as premium high-cost models. The metal brushed front panel with full length glass with LED back-lit display adds elegance to the model. One HDMI and one USB ports are provided on front for easy access. On rear side you’ll find complete array of ports including 5 HDMI input, one HDMI output and LAN. Overall, this fully loaded AV Receiver has god enough strength to compete well in market. If you’re looking for a high-end model from a reliable brand and ready to spend little more, this product could easily be your first choice.